This is a rather elegant razor from the masters at Muhle. Shaving with this every morning, will let you remember you are the man. With a Carre hardwood handle from the planes of Africa, this has always been seen as a spiritual tree. Also a long razor it feels as though you are weilding a scottish claymore of sorts. 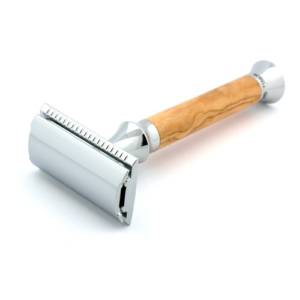 At 125 mm in length, this 72g safety razor which is relatively light for it’s length. 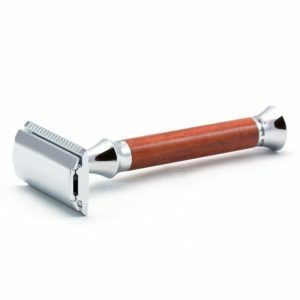 Will give you an incredible shave due to it’s solid built Muhle head. Flawless in design and engineered with presitige, it is middle aggressive and has a closed head. Which means there is loads of protection from the blade, but it will still give you the close shave that you are looking for. 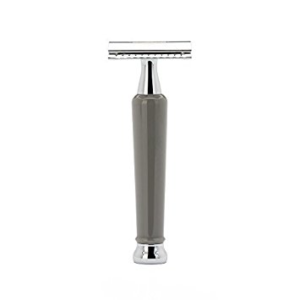 Made from plated chrome you will struggle to find any blemishes on the whole razor. The base is chrome as is the neck piece that fastens the screw mechanism. 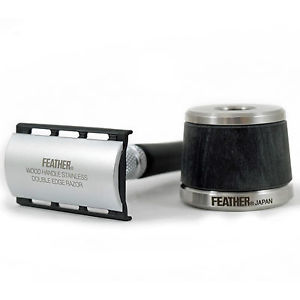 This impecable razor comes in a elegant box which is leather. Making this a brilliant gift for anyone who wet shaves. We recommend you use Muhle home brand blades as they are so firm and stay sharp. They are designed for their own razors so are obviously a great match. Safety razors are superior to cartridge blades in terms for holding back that five oclock shadow. They use a different technique to cartridge razors which is generaly smaller strokes on loose skin. Particularly on your chin and neck. Take your time as there is no rush. If you had a sophist safety razor you would take your own sweet time. You would enjoy the experience and it would be one you wish to repeat. We have loads of great tips on our epic blog so why not have a gander down the page.